Every poker fan will have realised that the online gaming revolution has transformed the way that we can play this classic card game. 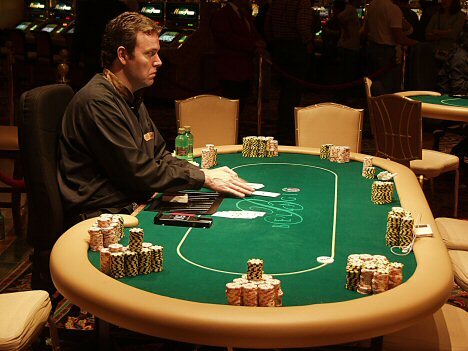 But is real-world physical poker in trouble as a result of the online poker trend? There’s certainly no shortage of high-profile poker tournaments that continue to show off the best poker players in the world. In fact, Qui Nguyen’s recent win at the World Series of Poker revealed how even complete outsiders can bulldoze their way to multi-million dollar wins in these respected and traditional gambling events. But if you look at the broader picture, it seems that more and more people are moving into the online domain to play this classic game. This trend becomes all the more noticeable when headlines about falling revenues on Las Vegas Strip illustrate how gamers are increasingly staying at home rather than heading to the exclusive, and sometimes expensive casino resorts. Whilst real-world poker will always have a devoted following of fans who play the game as a social activity, the benefits offered by the online alternative are becoming increasingly hard to ignore. Simply by visiting an online poker site like Elite Mobile Casino, it becomes instantly obvious that playing card games on the internet offers a level of convenience that cannot be equalled in the real-world. Such sites benefit by offering table games that are available 24/7 from any location, and the way that the gaming mechanics have been advanced, means that players can get an amazingly realistic simulation of the traditional gaming experience. Whilst some traditionalists would argue that online poker means that you can’t ‘read’ your opponents and bluff them as easily, many gamers have found that the lack of such distractions has helped them perfect their gameplay and collect their winnings in a more satisfactory manner. Because online poker sites don’t suffer from large overheads like building and staffing costs, it means that they can afford to offer larger payouts for the prospective gamer. And when these sites are able to offer tempting promotions to the newcomer so that they can take a few trial games without losing a penny, it’s also helped many people raise their skills away from the sometimes-intimidating real-world gaming tables. So although the physical game of poker will always be a part of our culture, it seems that for sheer convenience and increased payouts, it’s hard to argue with the merits of online poker.